Russia has officially assumed the mantle of holding the next Summer University Games in Kazan in 2013. 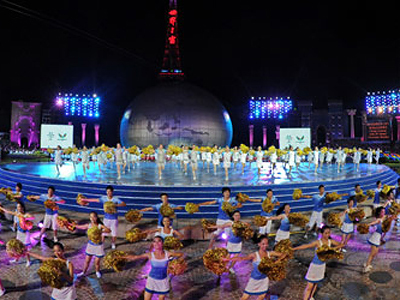 A lavish closing ceremony has been held in the Chinese city of Shenzhen to bring down the curtain on the latest global competition for students. Russia won 42 golds at the games in China to finish second in the overall medals table. However, their effort was dwarfed by the haul of hosts China, who notched up a staggering 75 golds. Rhythmic gymnastics superstar Evgenya Kanaeva was the biggest contributor to the Russian team’s tally. The world and Olympic champion added four golds and one silver to her trophy cabinet. But following the success of the Chinese event, the pressure is now on Kazan to stage a similarly impressive tournament. Russia's first deputy prime minister, Igor Shuvalov, confirms the construction of the Universiade facilities in Kazan is going as scheduled. "Construction in Kazan is going according to plan and will be completed on time," Shuvalov said during his visit to the Games Village in Shenzhen. The city will have a modern infrastructure, including transport system, which will allow athletes to avoid difficulties when moving from one facility to another, he added.